Dreamworks to Make ‘Captain Underpants’!?!?!? There was a long competition, but Dreamworks came out ahead. 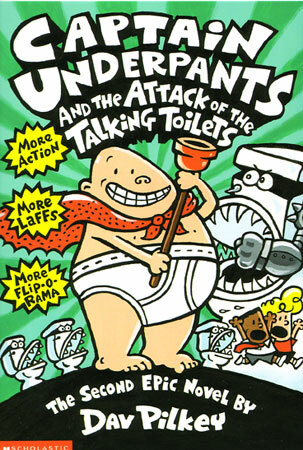 The feature film Captain Underpants is theirs, based on the eight-volume kids’ series by Dav Pilkey. The story is thus: a couple of fourth graders named George Beard and Harold Hutchins hypnotize their hateful principal and cause him to become the superhero Captain Underpants. Going from child-hater to child-lover, the good Captain goes on a series of wacky misadventures with the kids tailing him to keep him uninjured. The principal doesn’t remember his heroic deeds when he wakes up. The books have such villains as the Talking Toilets and Professor Poopypants. Rest assured the movie will be full of bodily function humor. It will be the most juvenile movie out in years, and the kids will eat it up. Parents may be less amused, but we sacrifice much for our children, don’t we? Just don’t let the kids learn from the main characters. We don’t need full-scale hypnostic anarchy on our hands. This entry was posted on Thursday, October 20th, 2011 at 4:56 pm	and is filed under News. You can follow any responses to this entry through the RSS 2.0 feed. You can skip to the end and leave a response. Pinging is currently not allowed. « ‘3rd Rock from the Sun’ Star to Give Us a Sense of ‘Community’!! !